This post comes to you from Rome, the Eternal City, where we are spending time exploring Roman ruins, eating carb-laden food, drinking delicious wine and surprisingly good Italian craft beer (there is a burgeoning craft beer movement here inspired by the now well-established craft beer scene in the United States) before we head off to Barcelona to join our friends, Sean and Abby, in a tour of Spain. I haven’t been to Spain since I studied there in the early 90s (god, has it been that long?) and Steve has never been there before, so we are both looking forward to it. Since my last post on the first six months of the journey we have spent some time in Istanbul (or Constantinople as Steve insists on calling it), an incredible city, which we explored for nine days learning about it and the various other parts of Turkey. I would like to return to Turkey to visit Gallipoli, Ephesus, Cappadocia, the Black Sea coast…what a trip that would be! Prior to Istanbul we were in Bucharest, a city that is still recovering from its Communist days and one I don’t really care to return to, and Budapest, a city we grew very fond of and definitely want to see again. We took a three-day trip outside of Budapest to Eger, a wine region we learned about at a sommelier-led wine tasting at the House of Royal Wines located on the Buda side of the Danube River. We loved the wines from this region, particularly Egri Bikavér, or Bull’s Blood from Eger, a red wine blend, and a white wine from Gál Lajos Pincészete called Egerszóláti Olaszrizling. It was this wine that inspired us to go to Eger, meet Dr. Lajos Gál, tour his cellars and, most importantly, taste his wines. We found out a lot about this region and Hungary in general, along the way. I have a weakness for dessert wines. 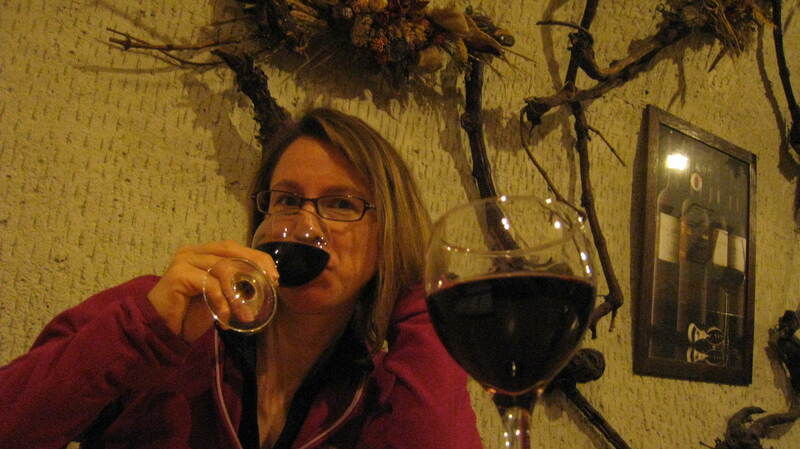 I am a big fan of Tokaij, the sweet wine from the Tokaj region in Hungary. My mother always seems to have many bottles of it and opens one or two on special occasions, so I usually associate it with her and holidays. When we decided to go to Hungary I assumed we would be drinking a lot of Tokaji while eating goulash and other paprika-dominated dishes. It wasn’t until we attended a fabulous private wine tasting led by a friendly and knowledgeable young sommelier named Andrew in the cellars at the House of Royal Wines that we learned that Tokaji is only part of the story. There are twenty-two wine regions in Hungary and wine grapes have been growing here since the time when the Romans colonized this area and called it Pannonia. Kékfrankos, Kéknyelű, Irsai Olivér, Hárslevelű, Kadarka, Furmint – all widely planted grapes, most native to Hungary, and all difficult to pronounce correctly. The Hungarian language is a funny thing. It is not an Indo-European language, but a Uralic language, and shares word roots with Estonian, Finnish and Basque (Look at a map of Europe. How the heck did this happen?) It was my first time in a country where I had no linguistic training to fall back on. Take the word “wine” for instance. It is “vinum” in Latin, “vino” in Spanish, Italian, Czech, Croatian and Slovenian, “vin” in French, Danish, Norwegian and Swedish, “wino” in Polish and “wein” in German. Easy to know what someone is saying even if you don’t speak the language. In Hungarian it is “bor.” Bor! The three wines we tasted at The House of Royal Wines. The one on the right was our favorite. In the year 1552, Suleiman the Magnificent, the Sultan of the growing Ottoman Empire, sent his army to Eger to besiege the city. 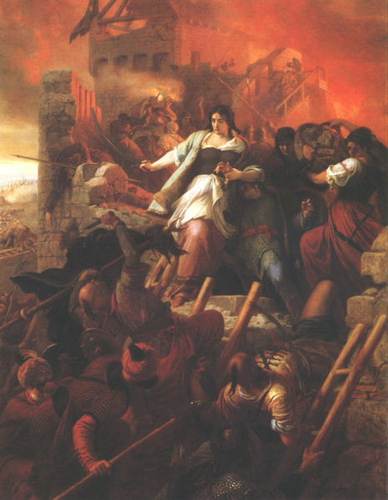 After one month, the people of Eger and the 2,000 remaining soldiers holed up in Eger Castle fending off the mighty Ottoman forces. Running low on food and more alarmingly wine, their captain, István Dobó (István is Hungarian for Steven, Steve is proud of saying), decided to mix all the remaining wine together, varying varietals, colors, flavor profiles, and serve it to his men. As a result of, or perhaps despite this, the outnumbered Hungarian troops were able to drive out the Ottomans, an army 80,000 strong (some accounts say 200,000, but let’s be real here.) The Ottomans were shocked that this happened. They noticed and remembered the Hungarians’ red-stained beards and surmised that they derived their super-human strength by drinking bull’s blood, the remnants of which were left on their chins. Since the Ottomans were Muslim and forbidden to drink alcohol, it didn’t occur to them that the red stain was from wine, (how well could they fight after having had a few anyway?) so they went with bull’s blood. The stuff of legend. 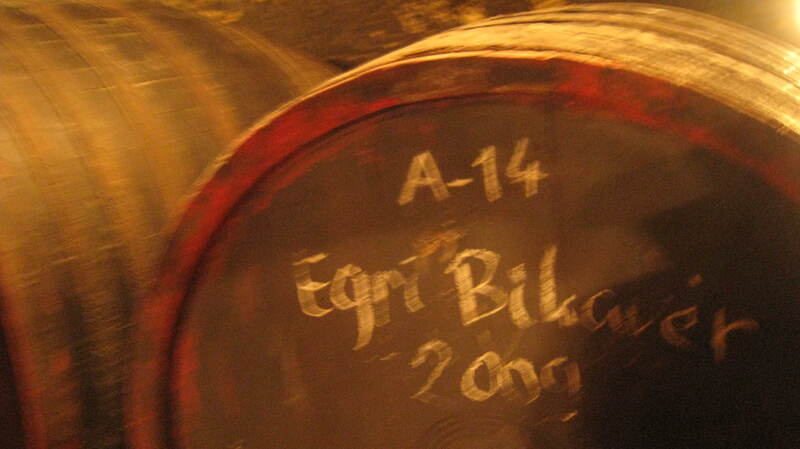 Bull’s Blood, or Bikavér, came to be known as an uncomplicated, boring, sometimes sour, red table wine during the dark Communist days and the Bull’s Blood from Eger, or Egri Bikavér, was no exception. Since the fall of Communism there has been a growing interest in improving the quality and perception of Bull’s Blood and Lajos Gál is one of the winemakers at the forefront. (Another interesting thing about the Hungarian language as the names. As in many Asian countries, Hungarians go by their last name first. Lajos is Hungarian for “Louis” and is the first name, but his winery goes by his last name, “Gál”, first.) The rules for Bull’s Blood are as follows: it can be made from among eleven varieties of grape, it must contain at least three different varieties, and no one variety can comprise more than 50% of the blend. The grapes allowed in Bull’s Blood include Kékfrankos, Kadarka, Cabernet Sauvignon and Merlot. But it was Lajos Gál’s sublime Egerszóláti Olaszrizling that got us on the train for a two-hour ride to Eger and The Valley of Beautiful Women. Steve, Tamara, Emma and Sandor aka Alex outside Sandor Pince, Eger. Szépasszony-völgy, Hungarian for The Valley of Beautiful Women, is an area southwest of Eger’s city center. We saw it in the throes of autumn and everywhere we looked seemed to give off a golden hue. Apparently, the name for this valley came from pagan fertility goddesses who used to be worshipped in this area before the arrival of Christianity. Located here is a wine Disneyland, a series of cellars and wineries carved in the tufa rock, many of which are hundreds of years old. The cellars, replete with long wooden tables, a bar and requisite wine paraphernalia hanging on the walls, are open to the public, some just in the summer, others all year round. It is a zoo here in the summer, with people coming to the area to drink wine, camp, swim and hang out at the tiny disco which no doubt plays awful renditions of popular songs put to assaulting techno beats. Since we were there in the off-season we really had the whole area to ourselves and didn’t see many other fellow tasters. We tasted wine of varying quality, a few with pronounced cellar funk, others complex and food-friendly. Some cellars offer free tastes, others insist you buy a small or large glass of wine, at one or two dollars a pop. The great thing about these establishments is that you can bring your own bottles – plastic or otherwise – to be filled directly from the barrel. 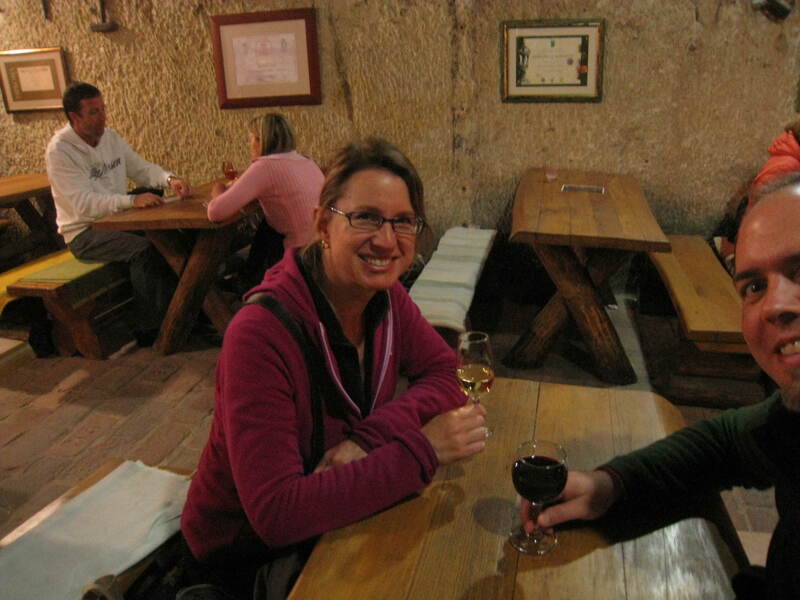 We did so at one of our favorite places, Sándor Pince, run by Sándor, who goes by the easier to pronounce Alex. Here we met the larger-than-life Alex, a huge fan of American music, and the beautiful Tamara, a high school history teacher who works in the cellar and tasting room, who kindly filled our one-litre plastic water bottle with their finest Bull’s Blood. Tamara said there are very few open positions for history teachers, so she is working at the winery while she continues to pound the pavement and learning more about the wine-making process as a result. In case you are taking notes, other places we enjoyed were Tóth, Hagymasi and Juhász. Gál Lajos Pincészete is a little bit different. It is open for tasting by appointment only, is located on a ridge overlooking the valley, and has no wooden tables, cutesy wine paraphernalia or even toilets to speak of. 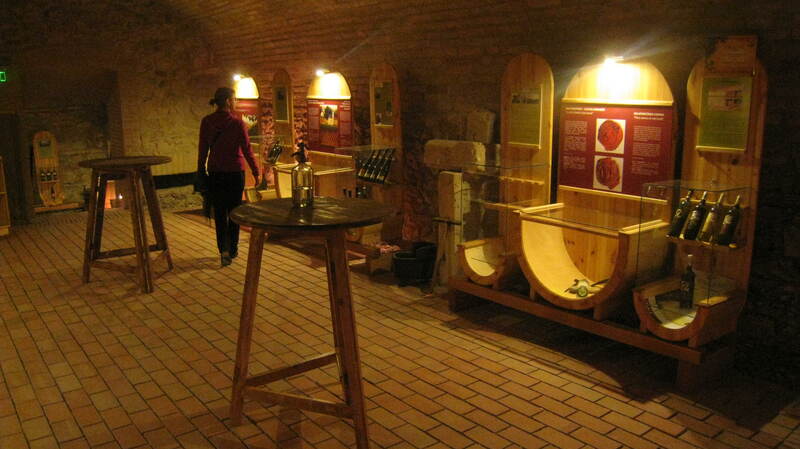 (Hungarian law stipulates that in order for wineries to be open to the public they must provide three toilets: one for men, one for women and one for winery workers.) I got the appointment with Lajos by sending an email, to which he responded surprisingly promptly with a suitable day and time, even offering to pick us up at our guesthouse. Lajos Gál is a busy man. He is a professor of enology and viticulture at the local college, sits on boards of various organizations committed to improving the standard of Hungarian wine, one of which is establishing an AOC system similar to that of France, and makes wine under his own label. After picking us up and taking us up to the ridge, we entered the cellar which was covered in a black mildew typical of these parts. I noticed that this mildew attached itself to many of the barrels, something which Lajos does not prevent from occurring, and in fact proudly pointed out the mildew to us by rubbing one of the barrels. He is winemaker of la méthode ancienne, the old method, and prefers to let the magic happen naturally rather than manipulating the process. 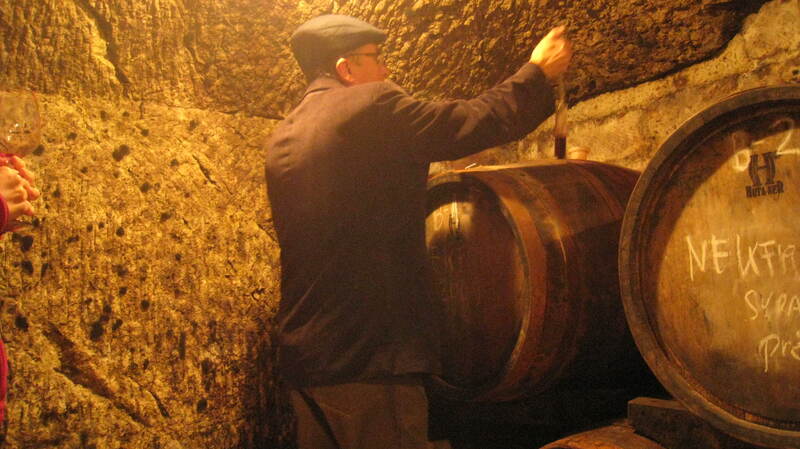 His expertise comes in his selection of grapes and barrels. He has eight hectares of his own but sources from several top vineyards in Eger. 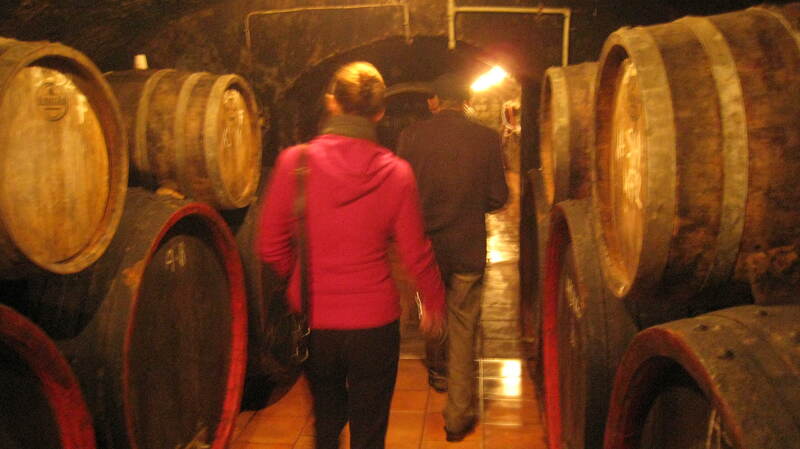 Lajos gave us each a wine glass, took us through his long narrow cellar, passing tanks that perfumed the air with that unmistakable smell of macerated grapes, down rows lined with hefty barrels to an area in the back where we tasted some of his whites directly from the cask. A lovely Chardonnay and the fantastic Egerszóláti Olaszrizling from the Kantor-Tag vineyard. This is the wine we came to savor. Its nose is aromatic but of the cellar, a little musty, a little dusty, its mouth-feel tight and focused, but it is the finish that truly wows. Honeysuckle, lychee, white peaches in a glycerin coat. An off-dry style, a beautiful wine: I have never tasted anything quite like it. 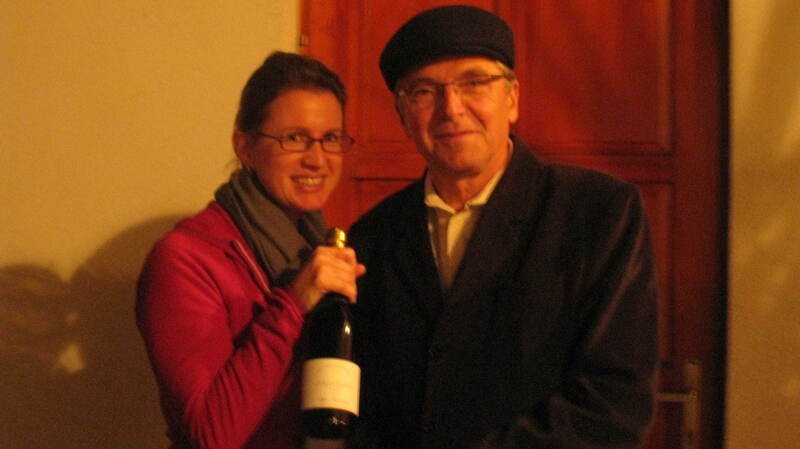 Emma and Lajos Gál posing with our favorite white, the 2009 Egerszóláti Olaszrizling from the Kantor-Tag vineyard. Outstanding wine. Lajos’ red wines are equally good. He used a pipette to dip into what seemed like 15 different barrels and had us taste in varying states of the fermentation process Kékfrankos, Kadarka, Cabernet Franc (a grape that grows very well in Hungary), Cabernet Sauvignon, Pinot Noir, Merlot, Menoire, Syrah and blends of the same. His Egri Bikavér, the famous Bull’s Blood, was wonderful. A burst of spicy red and black fruit and subtle herbaceousness with soft acidity and balanced tannins. Perfect for the goulash I was craving for dinner. Bull’s Blood needs two to three years of ageing before bottling, and the vanillins from the wood really does integrate the other flavors in the wine. The single variety bottling of Kékfrankos and Kadarka were solid as well, and we decided to take a bottle of each home with us. The Kadarka a special gem, with cherry and black pepper dominating the palate. And it is a native Hungarian grape! Lajos Gál’s “shop” is in his home, in the basement of his garage to be exact, and he took us to this haven where he labels bottles, stores cases and does tastings. Since we are backpacking, we had to be selective in what we brought with us, so we decided on the aforementioned Kékfrankos and Kadarka and, of course, our dear Egerszóláti Olaszrizling from 2009. We told Lajos we would be back to Eger to spend a longer sojourn there. Next time we will add some other wineries to the visit list, notably St. Andrea and Thummerer, as both are doing wonderful things with Pinot Noir. We may even work the next harvest and hang out with the other cellar rats. Or, at the very least, taste some more delicious nectar of the grape from this unique place on the globe. Photos from Eger and some of Budapest below! I had heard of the Hungarian language being rather difficult to learn because it is not like the languages of any of those in neighbouring countries. It is intersting that you mentioned similarities with the Basque language. I had heard that its origins were like that of Finnish and Estonian but not Basque. I am surprised that the Basques at the western end of Europe would have the same linguistic roots as the Hungarians of central Europe and the Finns and Estonians of the Baltic.The Hungarians seem to have managed to retain their distinct language despite the influences of the Germanic, Slavic and Romance languages of their neighbours. The area around Rutherglen in northern Victoria is well known for the production of Tokay. Your mother likes to sample some when she comes to Australia, as a number of local wineries sell Tokay, although it is usually made at Rutherglen. Seppelts had some for sale at Great Western when we took her to the winery there. You can make comparisons between the Victorian version and that of Hungary on your next visit to Australia. You mentioned that grape growing had begun in Roman times when the area was known as Pannonia. The Roman province of Pannonia became separated from Illyricum after the people there had helped the Dalmatians fight the Romans in what the Romans called the Great Illyrian Revolt during the reign of the Emperor Augustus. The revolt was defeated by legions led by Tiberius (later to succeed Augustus) and Germanicus who were the best generals of the emperor’s family. Later the province was divided into two by the Emperor Trajan and into four by Diocletion but extended east by Constantine. With the fall of the Roman Empire it was invaded by a number of tribes, including the Magyars, who seemed to have remained because their language has survived. It seems that the main legacy from Roman times is the winemaking, which is an important part of their agriculture and has enabled you to enjoy the products of their wineries during your stay in the country.